First, I want to thank all of you who entered the Konad giveaway. I'm hoping that while some of you came for the giveaway, that you'll keep following as I appreciate each and every reader! Second, it's time to annonce the winner! 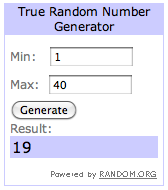 ...comment 19, who was Andrea from Canada! I'll be contacting you via email. If I don't hear from you in 48 hours I will choose another winner. Again, thank you to all who entered! I look forward to being able to share other giveaways with you soon!